I know for some of you my decision to move so suddenly might have come as a surprise. But for me this was a long term desire. I had wanted to live in the developing world since I completed my Master’s degree in 2010 in International Development. I yearned to be in the field, to see how people lived and to learn from their experiences instead of just assuming the NGO world knew best. When I first met Asghar, I was trying to make a decision between moving to Angola with the Peace Corps or to go to South India with Villgro on a nine month fellowship. Obviously I decided against both options and stayed in D.C. to invest my time and heart in our relationship. It was the right decision at that time. I moved to Florida, we got married and I went on to live a pretty comfortable life. But that wasn’t enough for me. I still craved the unknown and wanted to live abroad before it was too late to do so. Asghar supported this decision because he understood its importance having made the same decision years ago. He packed up his bags and moved to China after undergrad and lived there for a year and a half. I felt very lucky to have to a partner that understood my passions and supported them unconditionally. I started playing with the idea in the summer of 2013 and began reaching out to my network. I applied for a few positions but this was in the midst of producing TEDxJacksonville and working full time at PACE Center for Girls so I couldn’t give it my full attention. I got an email a week before TEDxJacksonville for a skype interview with Aide et Action. I knew I had the job when the call was over. I was confused, stressed and excited. I was also interviewing with a local organization and waiting for their answer. But in the end I followed my gut and accepted the position in Cambodia the Friday before TEDxJacksonville. The timing wasn’t perfect but when is it ever? Asghar and I are in the midst of purchasing a home and are set to close on Dec 12th. I am going to miss the move and our first days as homeowners. I will also be missing my best friend’s bachelorette party and bridal shower but was supported by her in this endeavor because she understood its significance. I will of course be there for her big day! After being here for two weeks, I know I made the right decision. I spent three days out in the field this week and was humbled by the poverty around me. I was also amazed by the generosity of the locals and their desire to change their communities for the better. So far I have visited the provinces of Kandal, Kep and Takeo. In Kep, I met a deputy commune leader who happens to be an amazing woman as well. Most of my meetings involve a lot of men and it was refreshing to meet a strong woman. She is proud of her career and the respect she has earned because she does not support corruption. We are looking to build two more preschools in her commune. In Takeo I met the most humbling man. He is in his late seventies and told us that he never learned to read and write and doesn’t want the kids in his community to grow up the same way. So he decided to donate his land to Aide et Action for a preschool along with a plot of his rice paddy so we could use the harvest for fundraising. I also got to visit some of our existing schools and met a lot of the teachers and kids. This was such an emotional experience because these kids literally have nothing. The kids were so eager to learn and to be acknowledged. I even got a welcome song from them. I hope their preschool experience makes them curious and excited to keep on learning. In total, we visited at least seven new prospective preschool locations and hope to have them up and running in the next few months. Most kids in the rural communities drop out after sixth or seventh grade. 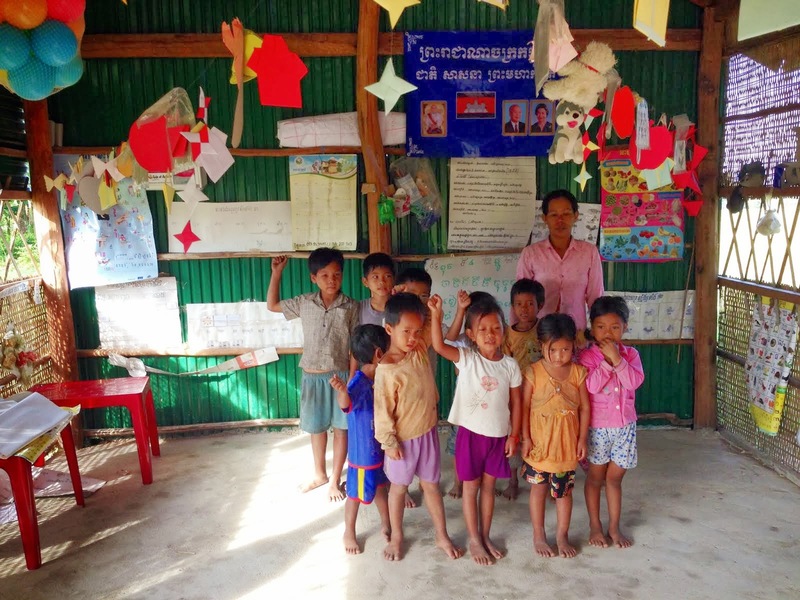 In Cambodia, education is not mandatory after the ninth grade. During this trip, I also got to explore the town of Kep. Yes, the province and the town have the same name. It is a coastal town on the gulf of Thailand and was such a refreshing change from the city. Our meetings finished around sunset so we were able to go to the beach and take in the view. Kep is also famous for its crab market. Letitia, a colleague who just started this week, and I opted to have dinner in the market overlooking the sea. This was a splurge at $11 but the meal was amazing! I ordered crab with green pepper and the famous Kampot pepper. I was seriously licking my finger after every bite and had crab juice all over my shirt. No bibs here. Sitting by the sea always brings me so much clarity and I was thankful to be able to do so in Kep. Sabeen, You are so inspiring. Love your stories. Keep coming back to read up on these.. multi times - especially today.. I know this is what you wanted to do and just is so great you are going all the way babe!